Today is a strange day. I am in Boston in my lunch break and it is sunny and rainy and warm and February. That is strange in it of itself. But stranger yet, is where I am going tonight. This evening, I am flying back to good old Fairfax, Virginia, where I will sleep in my adolescent house for the last three nights ever. That house, which I loathed when we first moved, was a game changer. In that house, I met some of the best friends someone could ask for. I made plenty of mistakes and plenty of advancements. I grew up from a very insecure girl to a slightly less but still awkward teenager to (what I would like to consider) a pretty squared away young lady. I've spent hours laughing, crying, watching movies with my family and gossiping with friends on my big blue couches. I've spent hours sitting at the kitchen table doing crossword puzzles and waiting for things to finish in the oven. Memories, people, memories. So it will be a tiny bit bittersweet for me. Happy my parents are both blissfully retired and moving into their dream lives, but sad that the place I called home for so many years will no longer be ours. So here is a little taste of home, one that I can count on when things they are a-changing. 1. Preheat oven to 300F. Grease a cookie sheet and set aside. In a large bowl, combine the oats, pecans, sunflower seeds, wheat germ, chia seeds and sesame seeds. In another bowl, combine maple/honey and oil. Stir into oats mixture, making sure entire mixture is saturated. 2. Spread entire mixture evenly in the prepared pan and sprinkle with sea salt and cinnamon/sugar. Bake in oven for 30 minutes and stir. Add coconut and cook until lightly toasted. 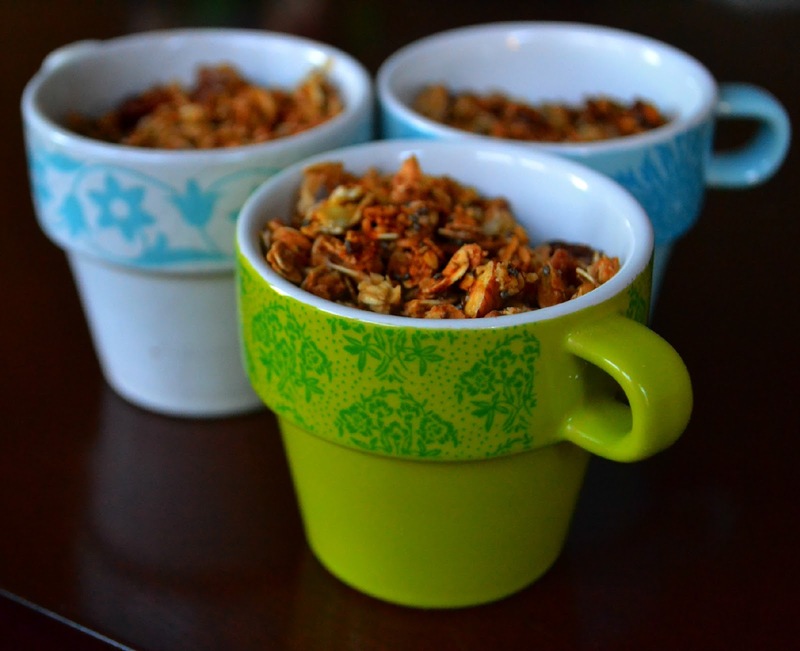 Should you choose to add dried fruit, stir it in after you remove granola from oven. I know that getting rid of a huge part of your life can be hard! But, the amazing thing is how much food and family recipes can keep those memories alive. This granola sounds perfect! I can't imagine how you'd feel. My parents live in the same house for 40 years or so. I'll be crushed when things change, but I hope they'll do it soon because he's 83.